The Maine Blizzard Clownfish is a color variation of the Percula Clownfish. 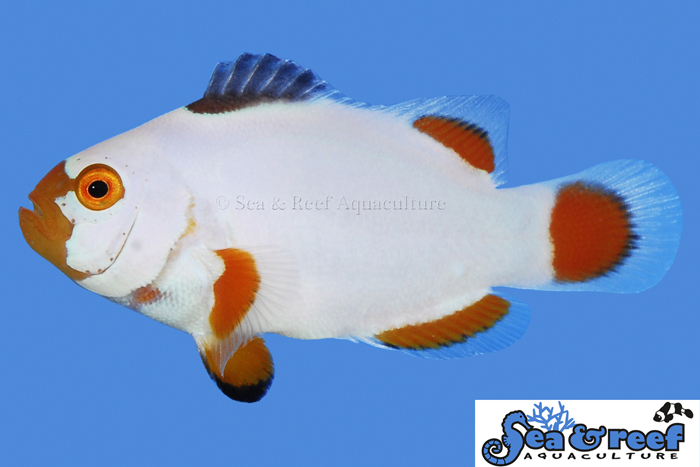 Sea & Reef Aquaculture created this variation by selective breeding of our Premium Picasso Clownfish and in the fall of 2008 the first Maine Blizzard Clownfish were born. To stare at these clownfish is to look straight into the heart of a Nor'easter. Their white is overpowering and blinding. Accented with orange fins and noses tipped with black coloration, the Blizzard Clownfish shows great contrast in the home aquarium. Temperament & Captive Care The temperament and captive care requirements for Maine Blizzard Clownfish are very similar to that of the regular percula clownfish. It is very peaceful and hardy. They thrive in saltwater aquariums with or without an anemone present. Feeding Most clownfish are omnivorous feeders, meaning that they will consume a variety of different food types. In nature the diet of clownfish consists of crustaceans (such as copepods and amphipods), algae, polychaete worms and leftovers from the anemone’s meal. Our captive bred fish are conditioned to eat a variety of aquarium diets including pellets, flake food, frozen Mysis shrimp, and frozen brine shrimp. Aquarium Host Anemones Like the Percula Clownfish, the Maine Blizzard Clownfish will readily accept a wide variety of host anemones and many hobbyists keep Maine Blizzard Clownfish with the popular and hardy Bubble Tip Anemone (Entacmaea quadricolor). As a reference, the natural host anemones of the regular ocellaris clownfish are Magnificent Sea Anemone (Heteractis magnifica), Sebae Anemone (Heteractis crispa), and Giant Carpet Anemone (Stichodactyla gigantea).